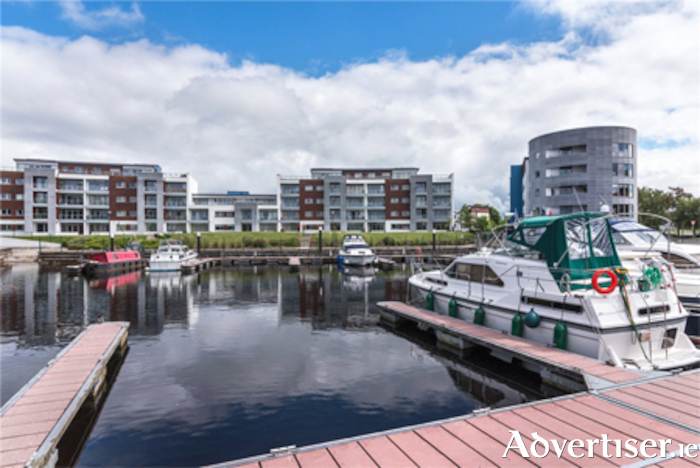 This home in Jolly Mariner Marina, Athlone, consists of a superb second floor two-bedroom apartment with a large balcony which offers views of the private marina and River Shannon. This property is finished to a very high standard throughout. Since its completion, the Jolly Mariner Marina Village has proven a very popular residential location due to its close proximity to the town centre, easy access to the M6 Dublin/Galway Motorway, and also the fact the vast majority of homes have superb Shannon views. The Jolly Mariner Marina Village also comes complete with a full time on-site caretaker, insuring that the development is at all times maintained to the very highest of standards. The apartment offers two bedrooms, one reception room, two bathrooms, a balcony, central heating and attractive decor. Located at basement level is a secure underground car park with direct lift access to the apartments overhead. The property is approximately 87 square metres with a BER B2 energy rating. Viewing is highly recommended. Contact agent Ollie Moore on (086 ) 8595186 for more information or to arrange a viewing.